It is Olympic tradition that during the closing ceremony of the ending games, the next country scheduled to host marks the transition with an abbreviated presentation, a sort of preview of what’s to come. Remember Beijing’s games in 2008, when London trotted out Leona Lewis, Jimmy Page, and David Beckham to highlight Britain’s greatest export—famous people? Well, last night Tokyo foreshadowed the 2020 festivities in an absurdly charming fashion, employing universally beloved Japanese-invented characters like Hello Kitty and Pac-Man to kick off the city’s hosting duties. Special honors, however, went to one little guy with a strong Italian accent. 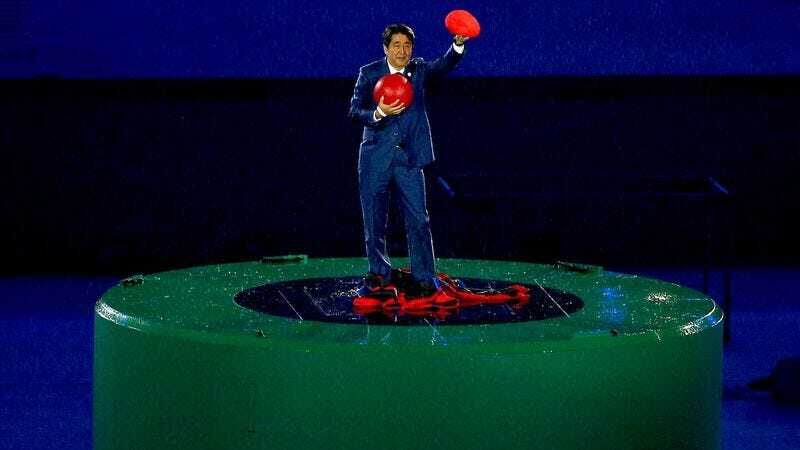 Japanese Prime Minister Shinzō Abe emerged in Brazil via a Warp Pipe—set up in a preceding video with help from manga robot cat Doraemon—dressed as Mario. Abe quickly shed the overalls for a distinguished-looking suit, but our hearts were already won. It was as if to say, hey, we created everything you hold dear, of course 2020’s games are going to be excellent. However, if the Tokyo opening ceremony is anything less than wonderful, we’re going to be seriously disappointed. But before then, we’ve got a Winter Olympics to tide us over. The 2018 installment will take place in PyeongChang, South Korea.